To those who participated for this workshop exclusively for my blog readers let me know your feedback! I got a lot of sms saying it was great! Also to bloggers who attended this workshop, kindly blog and let me have your link pls. I wasn't in the session 2, so I'd like to know how it went too. My review on this workshop will be up in a few days time after I get some rest, been running around too much & attending events plus shopping. This was the first cosmetic/ skincare workshop i've attended since a long time ago, maybe 10 years. Was also my first ever Clarins workshop. D Clarins' trainer;s, i think her name is Irene, presentation was v clear and we were taught how to use Clarins' products which were different from the normal way we would use other brands. Eg cleanser is applied all over the face then the dirt on our face was "vaccumed" up using our cupped palms. Also the manual auto lift using their star product "shaping facial lift"
We got to do a live roadtest or rather face-test using the actual products on our face following the trainer's directions. We did a full once-a-week regime of cleansing, toner, peeling and mask n moisturising. The products smell lovely and felt good on the skin. I thought that faces of the ladies' at my table were brighter and clearer after the whole regime was over. Clarins was v generous in this workshop, we were not restricted in the use of the products. In fact, I was asked to use more of the mask as it was too little on my face. U know lah, at home sure use sikit2 to extend use of the products!!! We could choose the particular products that suited our skin to use at the workshop. There were no little bowls of water to wash off the cleasing products but we were given moistened "mittens" to do so. I thought this was much more hygienic and less messy than bowls of water & sponges. Wish i could buy some of the mittens for travel use!!! so convenient. And yes, they provided us refreshments - lucky for me as I rushed straight to the w/shop after getting up late + quick shower and was starving. 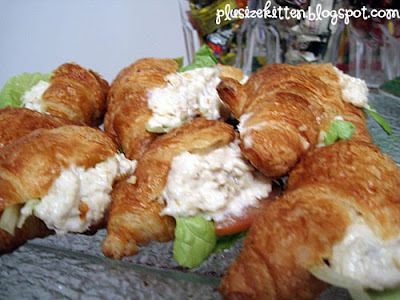 Paiseh but ate at least 2 of the mini croissants i think. Wish they had coffee !!! The goodie bag and our able to choose 2 more products to try (to be collected at specific counter)and the 1/2 price facial trial (RM68) was great. After this trial of the clarins products I am likely to give clarins a try. The only thing i wished for was that Clarins made available different trial sets for purchase after the workshop - I think these would have been a great hit!! Thanks so much to Clarins and to Miu for making this happen. Ooo...i say blog about the events first! since most people missed those. i say make us drool!! If I can give my ratings on the workshop I will give 10/10!!! 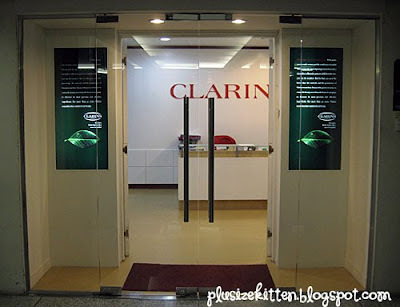 The Clarins assistance were really friendly and very helpful. They can remember our skin type and give us the products which suits us. Even when I visit Clarins counter in Isetan, this one particular SA she can remember me and she is very friendly and helpful to me. As for pricing, I find the pricing is quire reasonable compared to other products and it covers lots of stuff based on our needs. In conclusion, I learned a lots of stuff there, very satisfied and hope to attend more workshop from Clarins. EXCELLENT!!! Lastly, I want to thank for my darling Tammy for arranging this workshop for us. Without you, we will not be able to enjoy all the great stuff Clarins have to offered to us. THANK YOU TAMMY!!!!! WE LOVE YOU SOOOOOOOOOOOOOOOOOOOOO MUCH!!!!!!!!!!!!! PS: I will write my review regarding the "other workshop", that one will take time coz I need to choose my words carefully..if you know what I mean. Have a good week and rest gal. You need that. It was a great fun learning experience attending this Clarins Workshop. It indeed allows me to have an opportunity to try and hands on with Clarins product especially for newbie like me in-line with their theme “Power to Try Workshop”. All BAs was very helpful and provides great guidance for all the participants. My BA, Ms. Daphne was great; she was very knowledgeable and gives great assistance in showing the steps and explained in detail on all the important steps in order to obtain the best results. The presenter Ms. Erinn was very experience in guiding all the participants especially when she was explaining how to apply the products on the model, explaining all the steps clearly and show it on the model as well.. The venue was great as it was easily accessible and the duration of the workshop was just nice. Clarins really planned well for this workshop, the duration given for us to learn step by step is just nice, not rushing and all the participants are able to follow step by step in-line with the presenter’s pace. I was rather impressed that we even have time to do our 15 minutes mask. Clarins did a good job in preparing the refreshment for all the participants.. The refreshment for this workshop was tasty and they have quite a variety of refreshment to offer to all the participants and the amount of food prepared for all participants are adequate. I was impressed with the goodie bags given by Clarins, it consists of their Star product “Shaping Facial Lift” and their new launch product “HydraQuench Smoothing Gel”, Joli Rouge with a cute lip brush, “HydraQuench Cream Mask” and of course not forgetting a facial treatment at 50% discount. 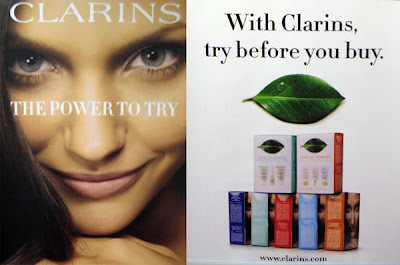 I heard a lot about Clarins facial, but never have a chance to try. Can’t wait to make my appointment and have an exciting experience there. Ohya, not forgetting we have the option to choose two more of our gifts from Clarins. Thank you, Clarins. Hope in future, Clarins could provide and sells gift sets, starter kits and their products during or after the workshop for those who are interested in purchasing the product after the workshop with some discounts. But, it is not too late for Clarins to offer to all the workshop participants as we will be collecting two more gifts of our choice in 3 weeks time at the designated counter like Metrojaya Mid Valley and Isetan KLCC, then probably Clarins would be able to offer some great deals just for those who had attended the workshop. Well, I really hope that Clarins would be able to consider in organizing another workshop just for body, to learn their products and get hands on experience as well. Really can’t wait to participate and sign up for the next workshop by Clarins. - They are super kind & helpful =) They're friendly too! - its great =) love those samples! and they even give us another 2 choice to choose!!! Great! 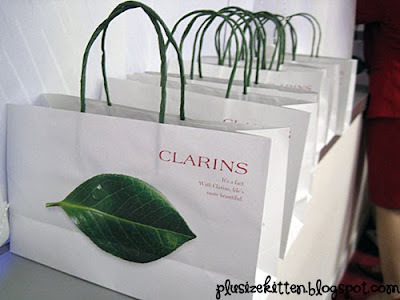 Miu, i had blogged about the Clarins workshop in my blog! Please check it out! P/S: Special thanks to Miu for coordinating this workshop and thanks Clarins for organizing the Exclusive session for Miu's readers!! Ms. Errin's introduction to Clarins products & presentation was well delivered. The hands-on experience was a really good approach. I had a chance to not only feel the texture of products used on my skin but also the way it should be applied. The BAs were very helpful and knowledgable. They suggested the suitable products that i should try on my skin with great results. The goodie bag was very generous, especially with the discount voucher. Always wanted to try a Clarins facial. Perhaps in future workshops they could make the starter sets availabe to the participants. It would be easier than trying to hunt them down at their counters. I went to the workshop with oily yet dehydrated skin but left with my skin feeling phreaking amazing. I've fallen in luv with Clarins! Thanx Miu & Clarins! :) And please organise more workshops..
That's all for the Clarins workshop! Everyone goes home happily and some even continue their shopping haul at Clarins counter after workshop, as they don't sell any products in the workshop!!! Overall experience: Very good and satisfying! Hope to attend more other workshops from Clarins if given opportunity! And guess what? I had already bought the Body Starter Set (RM 88) and will be heading to buy the Facial Starter Set (RM 68 - for combi oily skin type) soon!! Learning ~ I gained a lot of products knowledge from the workshop, it was a great experience! Service/Hospitality ~ The SA were great! Very helpful and quite knowledgeable! Food ~ Tasty & nice! Better than paid workshop!!! More variety of drinks as well! Most importantly -- Chocolates!!!! Goodie Bag ~ Excellent! Especially with their star products, what's more? 2 travel size of choice samples! Thanks Clarins!!! GWP/Promotions ~ Love their starter pack! Already bought the body starter pack, definitely will get the facial starter pack as well!! Suggestions/Comments ~ Keep up the good job and please please... organize more workshop for newbies like us to attend and learn more about the products!! Learning – I learned so much during this workshop. Apparently my, rub-product-on-hands-then-wipe-all-over-face has been wrong all this while. hehe! Goodie Bag – I’m quite happy with the goodie bag. Only one thing tho, I’m not too sure what to do with the CD because it seems to be just a write up of their company and my post is already too long to stuff more info inside. Suggestions/Comments – Maybe a slightly bigger space and also a longer session. Seems like we couldn’t try so many products. Or maybe I’m just greedy. Also a short get to know you session in the beginning would be nice because most of us only know each other online, or some not at all. Learning – The workshop gave me new information on how to apply and use their product. The technique of applying is so much different than what i used too. Service/Hospitality – I found that all the Clarins assistant on that day was helpful, friendly and patient. Eventhough we had to share the products, they made it much easier by helping us one by one. Venue/Time – Thank God i don't have anything to do on that day besides my homework, i guess 2 hours out for a workshop would really do me good, releasing the stress i have, and it did. i enjoyed the session, and i came home feeling fresh.the place is convenient as it's 10 minutes away from my home, and public transports are everywhere. Food – i guess it must taste nyum nyum...i was fasting. Goodie Bag – i didn't expect a goodie bag as it was a free workshop, so i guess of course no budget for goodie bags for all the participant...but once i turn to my left, i saw a bunch of goodie bags and i was thrilled. 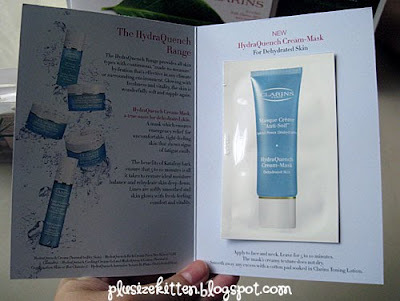 the product inside even make me happy as i really like the hydraquench mask. and i can't wait to use the 50% vouchers for facial, i would say its a bargain. GWP/Promotions – i heard that they have the rm88 starter kit and rm68 starter kit right? of course its a steal! Suggestions/Comments – overall i love the workshop. just so you know, that was my first workshop and i had a lot of fun trying all the products.i would suggest the slide presentation to be shorten and that organizer should take a group picture with all participants. in conclusion, i enjoyed attending the workshop as i didn't only got to try my hands on their products and experience the benefit out of it, but i also got to learn new things. Thank u so much, Tammy + Clarins for the awesome workshop! Learning - i learned a lot! not just about the products, but about how to actually use them. hehe. appretnly, i've been a total ignoramus all this while. my poor, poor face. Sevice/Hospitality - they were all soooo friendly & nice! even when we were being loud & noisy & super-excited & not paying attention (sorry!). plus, they were very knowledgeable about their products, and were able to advise us accordingly. Food - didn't have any. but your pictures look great! Goodie Bag - Happy with it! I guess probably because i got what i was fascinated with - the shaping facial lift, hehe. Suggestion/Comments - time flew by so fast! before you knew it, the session was coming to an end. maybe longer sessions, yeah? Thanks Miu! And thank you, Clarins, for the wonderful workshop! First of all i want to say thank you to YOU!!! Because of you, i have the chance to know about Clarins products and to attend Clarins workshop. Thanks to Candy, without her, i would never have the chance to know you and attend the great workshop-- CLARINS!!! This is my first time to attend skin care workshop and I had learnt a lot about skin care products as well as the correct step to take care our skin. Last but not least, I love you Tammy, i love you Candy, i love you CLARINS!!! Hi Miu! Sorry for the late review. I ada kursus frm 24~26th August. 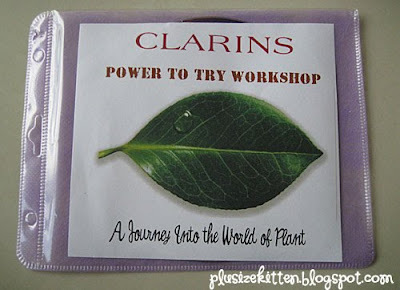 Here's my review for Clarins Power To Try workshop exclusive for Plusizekitten. Learning – I learned a lot during the workshop. About Clarins, the product and the most important is i learned the right way how to apply products on our face. Service/Hospitality – Very good. Very friendly. And very helpful too. I'm a blogger and i need to take some pictures so that i can blog about this workshop. I volunteered to be the model so i asked one of their staff to take the pictures for me. She help me took a lot of nice pictures. THANK YOU VERY MUCH. I really appreciated it. Venue/Time – The venue and time was good and convenient especially for people who use public transport like me. Food – I didn't ea the food coz i was fasting, but i'm sure it's yummy! Goodie Bag – The goodie bag is good. They give sample of their star product which is very good. Thank you to Miu and Clarins for the opportunity to join this workshop. Really looking forward for any Clarins workshop in the future! :D P/S: I haven't got the chance to blog about this workshop yet.sorry! Goodie bag - Awesome!! Luv all the samples n yess also the vouchers for facial treatment. Of course I dun wanna miss this special offer to try the treatment. Promotions - We can choose any 2 of Clarins skincare products. It's a good promotion for a newbie like me to try the effectiveness of the product chosen. Suggestions/Comments - As this is my 1st skincare workshop experience, I can say it was an awesome workshop and I've got lot of exposure on Clarins products and how to apply them. I hope Clarins can organize another workshop for make up or body care in future. Overall I really enjoyed the session. It's such a great experience for me. Soo happy :) Thanks to Miu n Clarins for giving me the opportunity to explore more bout Clarins products. Thanks for the giving me the chance to attend this workshop. Sorry for the wayyy overdue comment..but the workshop was GREAT!!! - The Clarins staff was nice and helpful. And they were very generous with their products! Did not stinge at all on anything. - There were more than enough food and it was great. Didn't expect to see any food at a free workshop! - I've not been to any other workshops but i'm feeling this is quite a good goodie bag as there was a discount voucher for facial, the samples were more like travel sizes and we got to choose 2 products as well!! - I'm not too sure what GWP/promotion is this referring too but I would love to buy a trial pack for their basic skincare! hey, It was a great workshop. They took good care of everyone and the presentation was very clear and good. goodies bag was good since it's FREE!! Anyway, I just didn't like the venue. It was too small for so many people and especially for the entrance where they served the refreshment, real pack and weird!!! And the inconvenience of going to toilet was a big cross for it. Learning - Definitely learnt a great deal on how to apply skincare and self-face lifting technique. Venue/Time - Venue was strategic, for me at least, easy to get to from my place and can park my car at Times Square. Time was good starting at 10am. And duration of workshop of abt 2 and half hour was just nice and well-planned out. And we were not rushed to finish off every routine we were doing. Food - overall, good. 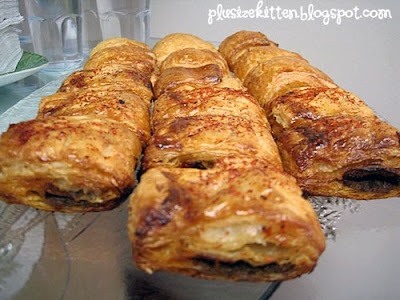 Suitable for breakfast but would prefer some coffee too :). 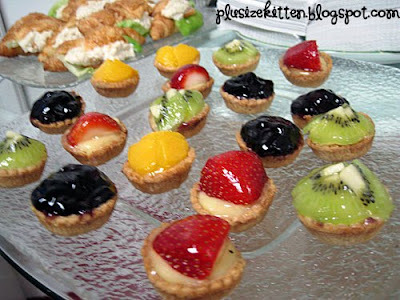 love those mini-tarts from Delifrance. Would definitely perk up my day. But I guess their rationale for serving water and some low-sugar drinks/herbal drinks also served its purpose. After all, it's a beauty/skincare workshop. So may be they want to advocate healthy eating as well?? 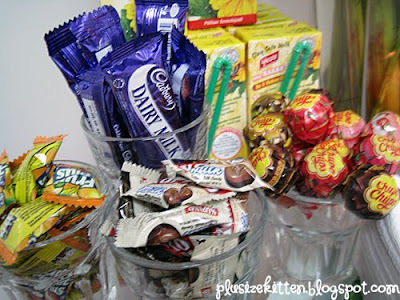 But the chocolates and sweets.....hehe, I didn't mind that either...as replacement for my morning coffee! 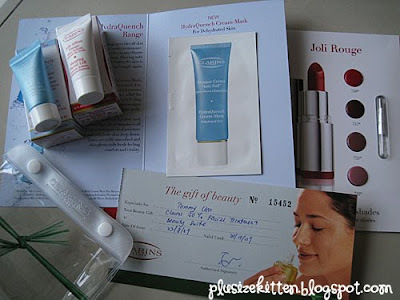 Goodie Bag - Clarins is very generous with their goodie bag. It's a free workshop but they definitely didn't stinge on their goodie bag. 2 travel-sized samples and with lipstick samples some more. and 2 more samples of our choice to be collected later at 1 of 2 counters of our choice....Wow!! haven't seen such kind of workshop...so generous and accommodating! GWP/Promotions - No GWPs offered at this workshop since they were not selling anything. But we got a 50% off on their 1st trial facial. Suggestions/Comments - Erinn mentioned something about not being want to hard-sell at their workshops. But as discerning consumers, we know when a brand is trying to hard sell us or not. Hence, having some of their starter/trial kits for sale at the workshop, to me, is fine. Esp when the workshop was held in a venue other than their counters, it may be troublesome for some who are really interested to purchase some of the tried products at the workshop to have to go look for a Clarins counter to do so....just for the convenience of some. firstly, i'm very sorry for this late feedback, as you know, i was away on holiday. on behalf of my 3 other colleagues, intan, jen & kelly, we wish to thank you sooooooo very2 much for giving us a chance to attend this workshop !! we are not really 'workshop kaki' but we find this workshop very well organized and awesome. we are very impressed with everything...the presenter, helpful & attentive staff, the refreshment (yummy2 tarts), lovely goodie bag & the generous flow of their products. when i collect the 2 trial size samples, i will definitely look at other available products at their counter for my sensitive skin. thank you again for the given chance to attend this wonderful workshop & we would look forward to (more ??) upcoming workshops !! pls do organize more workshop for us, ok or not ??!! Oh i forgot to tell u that i use some of ur pictures coz i've accidentally deleted mine. Hope u dont mind. Credits already given to u (and Cuna too). If u're not comfortable about it, let me know i'll remove them ya? When is the next facial workshop in 2012?